Since Old Vine Cafe opened in 2007 at the ultra-hip-it-hurts shopping mall called The Camp, it's gotten a smattering of accolades. It was the winner of OC Weekly's Best New Restaurant for 2007, and recently it's number two on Chowhound's Ultimate O.C. Restaurants Poll, second only to Marche Moderne. Since I clearly missed the boat the first time around, I cashed in one of my Christmas gifts (dinner at a restaurant of my choosing) to finally visit the place. First thing I notice after we found it at the end of a meandering path -- past the rope hammocks and the fire pits -- is that the restaurant is pocket-sized, like an hor d'oeuvre for the larger-than-life but insanely overpriced Charlie Palmer a few blocks away. Appropriate then that the menu is comprised entirely of small plates. "We don't do full entrees", the waiters tell everyone. You either opt in on the prix-fixe (there are three kinds) for $65 per person, which includes wine-pairings; or choose to dine a-la-carte. Whatever you decide, you'll discover Chef Mark McDonald's true calling: to pummel your taste buds with flavor. Old Vine's food is so bold...so over-the-top, it borders on abusive. This is cooking with a bullhorn and a chest-thumping kind of machismo. The guy is not above sprinkling fried onions on stuff, and when he says something has Maytag blue cheese, you better believe you're going to taste it. His Crispy Blue Salad ($9.50) has both. I've never had a salad that made me wince. This one did. The blue cheese -- though it's dissolved completely into the dressing -- is at decongestant strength, rivaling wasabi's sinus-clearing power. Meanwhile, the crispy fried onions fought against the strips of crunchy prosciutto. The onions won handily, but my mouth was the victor. 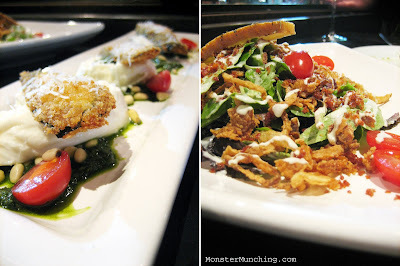 Then there was his basil pesto in the Eggplant Buratta ($14). The cheese -- ropy and taut on the border, blubbery in the center -- was the base for a panko-crusted plank of eggplant. But below, it was the pesto that tickled my nostrils even before I tasted it. Proteins were next. 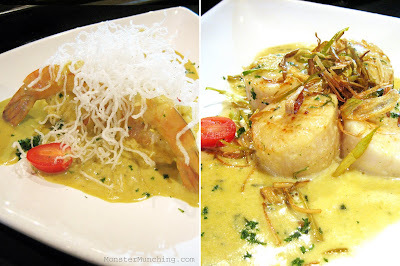 If the three prawns in the Asian Curry Shrimp ($16) were any bigger, it would've been a lobster tail. The meat of one equaled two mouthfuls, and it couldn't have been cooked better or more precisely if a stopwatch was used. Despite the fact that the sauce sang of lemongrass and coconut milk, it could've used less salt. And since no rice is served or offered, the sodium saturation became immediately overwhelming. Sauteed Scallops ($16) came in a foursome, again perfectly cooked. They were then showered with fried leeks and smothered in a tarragon-chardonnay sauce that whispered slightly of Chinese five-spice. Each bite was like Jell-O: A jiggly, slippery ambassador of the sea. What came next was what I called the Stonehenge of Starch; They named it Polenta Pomodoro ($11). Wedges of pan-fried cakes of polenta stood upright, draped with sauce and pecorino romano cheese. Solid on the spoon, each scoop I took turned into liquidy mass of cornbready goop in my mouth. And the sauce? Brilliantly realized with shades of garlic, tomato, and cream. Grown-ups and children alike would love the Porcini Mushroom Mac & Cheese ($12), which is one of the most expensive bowls of mac-n-cheese I've ever encountered. But in every humble-looking forkful, there is a blend of artisan cheeses. Pleasantly gritty and tangy, but never rich, this is a mac-n-cheese one never tires of eating. The one and only disappointment of the night was, coincidentally, the dish that could've been construed as the main course. 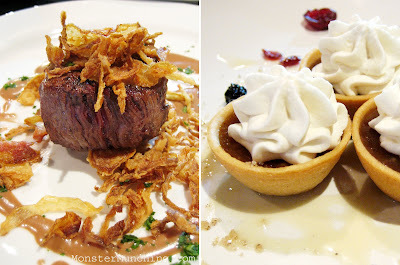 It misfired only because the Petite Filet Mignon ($16) tasted like a repeat of the Crispy Blue Salad -- it had two of its main components. And by this time, the fried onion and blue cheese seemed overplayed. Also, since they neglected to ask how I wanted it cooked, the thick hockey puck had a bloody center. Old Vine's Pecan Tart ($7) brought things back in line, and in it was a first for me: salt with dessert. And not just any ol' salt, but a vanilla-infused fleur de sel. You drag the mini pastry cups around on the plate to catch a few grains. Then you pop it in. Salty combines with sweet; and a small, seemingly insignificant morsel becomes a revelation -- sort of like Old Vine itself. What a great post! The food looks very interesting and very bold; just like what you describe of it! It looks like there are a lot of different textures, especially in that salad. old vine is one of my favorites as well, next to marche moderne. i lurv their caprese salad. i do have to admit that the salad does make me wince too. it's too 'fried' and 'creamy' to be a salad for me. Can't wait to try this place. Nice to see you do a write up on a different style of cuusine! Didnt even know this place existed. Enjoyed the ramen write up too. > i know it was enjoyable on some aspects to you, but can't really tell if its a really good place or a mediocre one based on the write up. That salad was a texture explosion! Not to mention a flavor assault. This place is not short on boldness, that's for sure. You're right. That salad is over-the-top, but on the contrary, it's why I loved it. Although next time, I think I'll order that and nothing else. It's a tastebud workout! I think a macho man like you would love the place. But like I said, there is no main entrees. Think of them as a place to tickle your taste buds, or more appropriately smack them around a bit. As for Ajisen, I loved a couple of things: the spicy pork ramen, the baby squid, and the beef bowl. But I didn't care for the regular ramen simply because of the temperature (it wasn't that much of a factor with the spicy pork ramen, since it was frickin' tasty -- but that too could've been more awesome than it was if it was served boiling hot). I also didn't mention it (I had to keep the review short), but their yakisoba is no good either -- all salt and no game. Overall, I'd say that Ajisen is decent, not spectacular. One simple thing they could do to take them one notch higher is HEAT UP THAT FRICKIN' SOUP TO BOILING!!! That would be a good reason as any! Several times recently, in search of some good food and some tranquility, I've wandered over to the [still excellent] Native Foods in The Camp. During each visit, I've noticed that most of tables at Old Vine were filled with diners who looked like genuine foodies. I can see why...seems like an innovative menu that would appeal to a variety of whims. 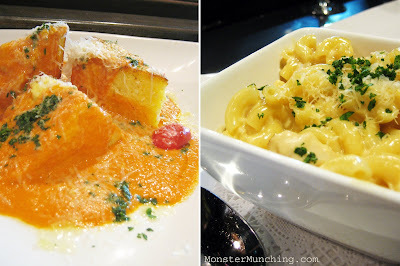 The scallops, the Polenta Pomodoro, and the Macaroni and Cheese look really tempting. Old Vine appears to be a great prix-fixe option, especially if you're in the mood for some wine. Thanks Elmo! Thanks for this reminder : I need to go back! I couldn't tell from the post and their website but is the wine included in the tasting menu price of $65? Thanks for the help. My only regret is that I'm no oenophile. Otherwise I'd be all over that prix-fixe. Either way, the food is wonderful. I didn't mention it, but they support CSA and most of it is featured in their seasonal prix-fixe. But when you find it, it's like finding the cheese at the end of the maze! YES! The $65 includes wine! Four courses, each with four glasses of wine to go with it (port is paired with the fourth course, which is dessert). I'm glad you took on this review. This is not the easiest place to review and I know quite a few people had a rough time determining if this place's consistency is up to par. Confounded by the fact the owner goes to various website to personally questioned each reviewer's taste that disagreed with the restaurant. Other than the Petite Filet Mignon, which you disagreed with how it is served, I think you gave a very fair review of the place. Hope the owner appreciate this one. Actually, it was one of the easiest places I've reviewed...I guess because I really loved it. Save for the rareness of the steak (I like mine on the medium side) and the salt-level of the shrimp, everything was flawless. That blue cheese salad sounds like my kind of salad! I am a fan of blue cheese. Actually, I'm a fan of any food that makes my breath stink. It's a wonder I found a husband! Since this salad also had onions, you probably could've fetched TWO husbands! HAHA! 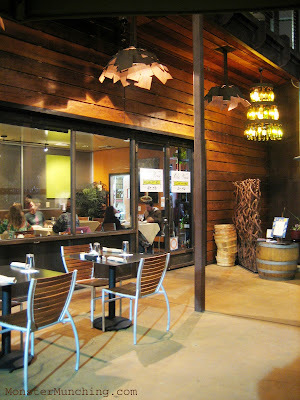 I love Old Vine Cafe - I just wrote about it on my blog too! So great to have such an ambitious and exciting place in the OC! Great write-up -- I felt like I was right there with you! Yeah I have to admit I find his insulting emails to people who happened not to like the place rather disturbing. But it's still on my list of places to eat. I'll stay away from that salad though. Wow, I would have never thought that blue cheese could be so much that it would be comparable to wasabi! Well, I am glad that you tried this place out when redeeming your Christmas present. I wish I had such a Christmas gift--I would say I want to eat at Elmo's house! What can I say? Too many places. Too little money. Notice that I got treated for this meal! I just read your wonderful review as well. I'm smitten too, and proud as hell this place is in O.C. and that L.A. folks like yourself are coming down for it. Yeah, I only found out about that after I wrote the review. Though any restaurant owner has every right to defend himself against bad reviews, there's probably going to be some blowback if they go too much on the offensive. As they say: A satisfied customer tells 10 people, a dissatisfied one tells 100. Who knows what the effect is when you add confrontational e-mails to the equation. NAH. Then what you'd get would be fried SPAM with rice and boiled cabbage. That's about the only thing I cook consistently nowadays! I love love love Old Vine Cafe. Last time I was there it was like we had the place to ourselves and the food was amazing. I haven't been back since but I will be changing that soon! This place is great isn't it? I don't know why it took me so long. Next time, I wanna try breakfast!